Our nurseries cover two sites in the prime agricultural lands of East Lothian and have been designed around the plant container unit so that we grow the healthiest root systems possible for our plants. We are focussed on quality from the start and so must source the best seed available for growing in the UK. You can’t grow good trees from poor seed and at Alba Trees, we harness the very latest forest research to select the best seed possible for UK conditions. For native trees, this means employing a network of collectors throughout the UK so we can match your provenance zone as closely as possible. For productive trees, the best seed tends to be available on trees grown outside the UK, so we work with global seed suppliers to source the very best seed, subject to stringent biosecurity controls. Classification of seed quality is described on our availability and pricing page. Craig, our Seed Manager, runs our sowing operations from Tunnel 14 and is responsible for imposing quality standards at the beginning of the plants’ lives and starting the traceability system. We treat most of our seed before sowing to improve germination, but it is still often worthwhile sowing into seed trays so that we can rogue out poorly germinating seed. This is an efficiency step and prevents us from filling up growing space with lots of empty containers where the tree has not germinated well. These empty containers can also harbour weeds, so we do everything we can to get as near to 100% of our cells growing viable plants. Each growing frame is given a bar-code which relates to the seed lot and the trees stay with that barcode until despatch. Traceability of seed and stock is essential to our business and we have invested in a bespoke system. We try to mechanise operations wherever we can, but the variable size of seed and tree means most of this work is still manual. However, our container filling is mechanised and we use a range of specially formulated growing mediums to get the strongest plants. Our Managing Director has created these formulations using over 35 years’ experience in horticulture and they are naturally a closely-guarded secret! When the seedlings are large enough to be handled, they are ‘pricked in’ to their final container. This is a delicate operation as the seedlings can be easily damaged at this stage so our staff need to be careful, precise and fast for a whole day’s work in order to maintain the highest standards. Being such a large nursery, we can switch people’s tasks around so that they get an occasional break from this exacting job. Once the plants have been pricked into their final container, responsibility for looking after them passes from Craig to Derek, the Nursery Manager. We have recently upgraded our greenhouses so that we have some of the newest and best facilities in the country. Greenhouses are only used at the start of the growing cycle to ensure the seedling receives enough warmth to establish within the container, but our aim is to get our plants as hardy as possible so we get them outside to grow naturally as as they are strong enough. The plants will remain in the greenhouses until they have established well enough to withstand outside conditions. Derek will choose a period of warm weather in which to move them to their growing position outside, where they will stay until they have grown to their full height and are ready for despatch. The plants are constantly monitored by Derek’s team, who adjust their feed and watering regime according to conditions so that they get the full benefit of hard, Scottish growing conditions. The Sales Team have access to information about every seed lot of every species on the nursery and will allocate them to quotes and orders. When the order is ready to be graded, they raise the order, which processes through to the grading and despatch teams. Ryan the Grading Manager organises his team for the day and coordinates all grading operations. Our ordering and traceability system keeps an electronic map of the location of each seed lot in the nursery so the forklift driver can collect the stock quickly. Once the stock has been brought into the shed, it will be a natural mixture of heights, girths and viability. The Sales Team will have indicated the grading specification on the order and Ryan ensures that his team selects plants within that range. It is normal for a frame of trees to have grown between 10-60 cm and a split grade between 20-40cm and 40-60cm is the preferred specification for the graders, but they will adjust the specification to the customer’s needs. Each species is tightly packed in bundles of 15 plants using black film to retain moisture and protect the roots from damage. Keith, our Order Supervisor, and Alex, Despatch Supervisor, then organise the collation of graded stock into orders using the packaging method specified by the Sales Team on the order, or as requested by the customer. The despatch team then loads the order onto the delivery vehicle, checking the plants against the order for quantity, seed lot and quality. The order is then submitted to Kevin, the Transport & Despatch Manager, for a final check before it leaves the nursery. 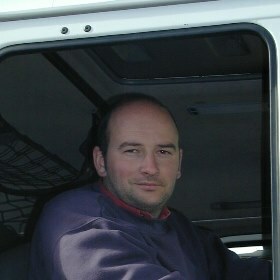 Scott is very often the public face of Alba Trees as he has been our driver for over 20 years. He will deliver almost anywhere in the UK, including up forest roads, and has a well-earned reputation as being both friendly and helpful. Our Sales Team will raise all the invoices 7 days after delivery and want to make sure you are happy with your stock. We will have checked all our plants 3 times before sending them out, so if there is an issue we really want to know about it.